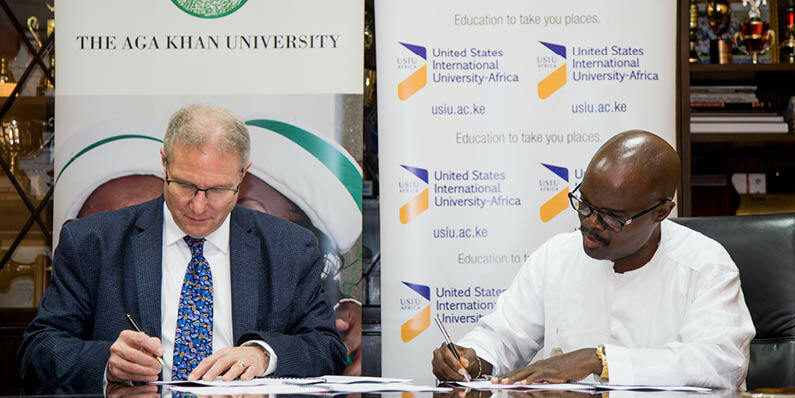 Aga Khan University (AKU) and Kenya’s United States International University Africa (USIU-A) are set to collaborate on a range of projects that will enhance the research and training opportunities open to students and faculty from both universities. A Memorandum of Understanding has been signed between the two universities under which AKU will provide attachment placements for USIU-A students at its teaching hospital, Aga Khan University Hospital, Nairobi (AKUH-N), while USIU-A will provide locum places for nurses and pharmacy technicians from AKU. Both institutions will collaborate in the conduct of research and other innovative projects, with faculty and staff being encouraged to team up on community research projects and to co-sponsor joint seminars and workshops in areas of mutual interest. This partnerships extends from a March 2018 initiative, where AKUHN and USIU-A established a programme enabling students from USIU-A's School of Pharmacy and Health Sciences to benefit from an on-site training program at AKUH-N. The training is designed to enhance students’ theoretical knowledge and clinical skills by exposing them to rotations in critical care, paediatrics, and the general wards, followed by discussions with the assigned university faculty. The ongoing partnership gives students exposure to the diverse roles that pharmacists play in an actual hospital setting in areas such as the establishment of protocols for the appropriate selection of drugs; dispensing of medication; call back engagement with prescribing doctors and application of global medication management standards. Students are also made aware of benchmarks in relation to clinical skills, quality, and ethical practices. These are essential requirements for Joint Commission International accreditation. Through this experience, students become better equipped to improve and sustain the quality of pharmaceutical services they will provide in their future job postings. Speaking at the signing ceremony, Dr Robert Armstrong, Founding Dean of AKU’s Medical College, hoped for more shared endeavours in the future between the two universities. “In the future, we hope to collaborate in other health science education programmes and health sciences research,” said Dr Armstrong.